Christmas berry sprays are very popular for decorating wreaths, porch pots, planters, Christmas centerpieces, and other holiday decorations. 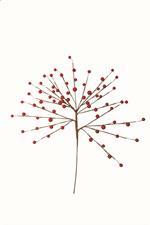 This Red Berry spray can be used for Christmas wreaths, porch pots and centerpieces. 13'' Tall 12 Stems per bag. 100% waterproof soild plastic berry. The cluster berry pick has thick clusters of red and burgundy berries. It's great for porch pots, Christmas wreaths, and arrangements. 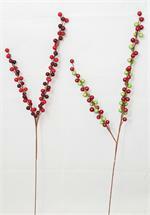 Cranberry and Red/Green Berry Spikes for all your decorating needs. 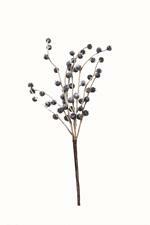 This berry spray is about 12 inch long and has about 25 lacquered berries at approximately 10mm in size. Sold each. One of our most popular berry picks! The berries are packaged in 6 stems per bag. Each berry pick is about 8 to 10 mm in size and 6 inches long. This blue berried spray is 12'' long. This burgundy berry spray is great for adding color to wreaths, arrangements, and porch pots. These Chili berry sprays are the hottest item in wreath decorating and ribbon crafts! For a spin on classic wreaths, the Chili berry spray is an excellent addition to your craft project ideas and bough decorations. This Christmas Berry spray is approx 20'' long. Decorative pik that can be used in wreaths and centerpieces. 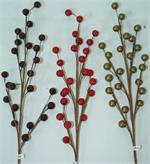 This 27'' crab apple spray is perfect for Christmas decor, floral, and craft projects. This Juniper berry spray makes a great addition to any Christmas wreath or floral arrangement. Approx 10'' tall. 12 per bag. 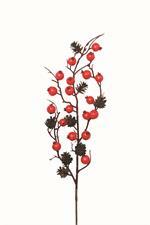 Lacquer Sprays Gold Berries are approximately 10 mm, the overall height is around 14"
This Lacquer Sprays Silver Berries are approximately 10mm, the overall height is around 14". This leafy spray is glittered and makes a great addition to any Christmas wreath or floral arrangement. Approx 10'' tall. 12 per bag. 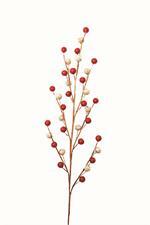 This cherry pik features three painted cones along with 8 berries. Approx 10'' tall.